Note: Visual Studio 2017 is recommended for developing .NET Standard libraries. Visual Studio 2015 can work but the .NET Core tooling was brought only to Preview state. 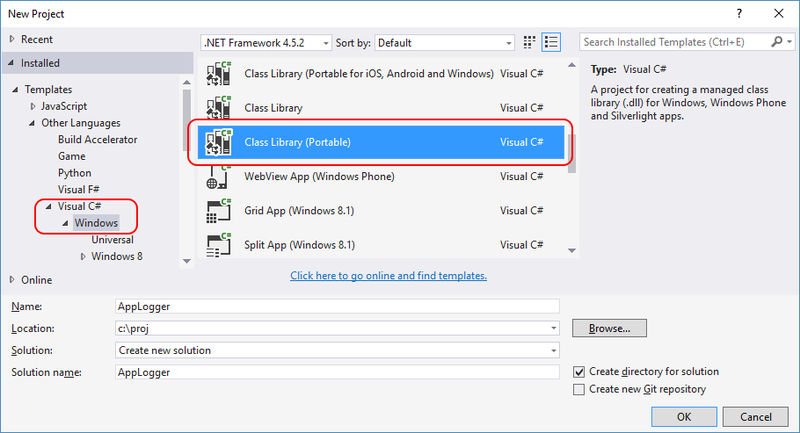 See Create and publish a package with Visual Studio 2017 for working with NuGet 4.x+ and Visual Studio 2017. The .NET Standard Library is a formal specification of .NET APIs intended to be available on all .NET runtimes, thus establishing greater uniformity in the .NET ecosystem. The .NET Standard Library defines a uniform set of BCL (Base Class Library) APIs for all .NET platforms to implement, independent of workload. It enables developers to produce code that is usable across all .NET runtimes, and reduces if not eliminates platform-specific conditional compilation directives in shared code. This guide walks you through creating a NuGet package targeting .NET Standard Library 1.4 or a package targeting .NET Framework 4.6. A .NET Standard 1.4 library works across .NET Framework 4.6.1, Universal Windows Platform 10, .NET Core, and Mono/Xamarin. For details, see the .NET Standard mapping table (.NET documentation). You can choose other version of the .NET Standard Library if you want. NuGet CLI. Download the latest version of nuget.exe from nuget.org/downloads, saving it to a location of your choice. Then add that location to your PATH environment variable if it isn't already. nuget.exe is the CLI tool itself, not an installer, so be sure to save the downloaded file from your browser instead of running it. 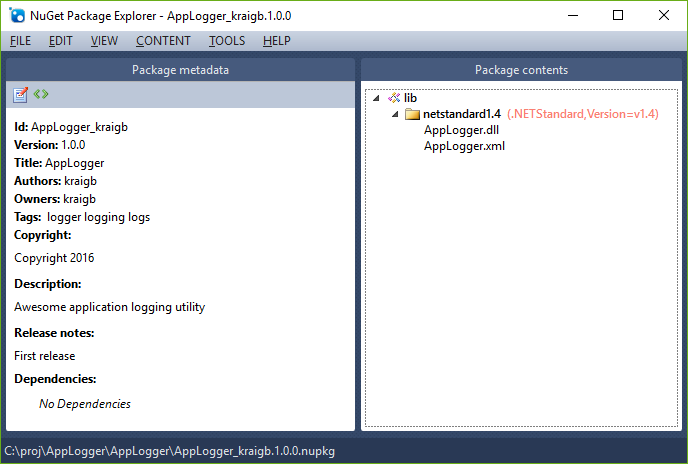 In Visual Studio, File > New > Project, expand the Visual C# > Windows node, select Class Library (Portable), change the name to AppLogger, and select OK.
Click on the Build tab, change the Configuration to Release, and check the box for XML documentation file. Set the configuration to Release, build the project, and check that DLL and XML files are produced within the bin\Release folder. Open AppLogger.nuspec in an editor and update it to match the following, replacing YOUR_NAME with an appropriate value. The <id> value, specifically, must be unique across nuget.org (see the naming conventions described in Creating a package. Also note that you must also update the author and description tags or you get an error during the packing step. Right-click the solution and select Build Solution to generate all the files for the package. The syntax of the version attribute here indicates that version 8.0.3 or above is acceptable. To specify different version ranges, refer to Package versioning. Visual Studio display readme.txt when the package is installed into a project. The file is not shown when installed into .NET Core projects, or for packages that are installed as a dependency. A .nupkg file is just a ZIP file with a different extension. You can also examine package contents, then, by changing .nupkg to .zip, but remember to restore the extension before uploading a package to nuget.org. To make your package available to other developers, follow the instructions on Publish a package. Note that pack requires Mono 4.4.2 on Mac OS X and does not work on Linux systems. On a Mac, you must also convert Windows pathnames in the .nuspec file to Unix-style paths.